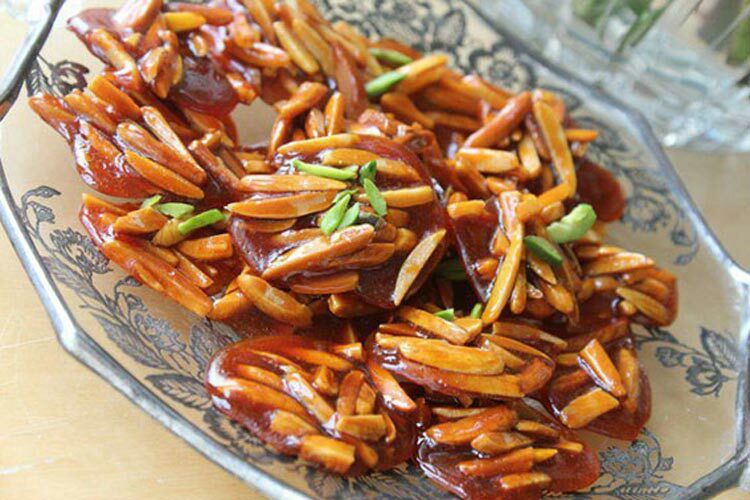 One of the most delicious homemade sweets prepared for the Persian New Year is Sohan Asali, which is a combination of honey and Sohan, a traditional saffron brittle toffee indigenous to Iran. The Asali version of these sweets is cooked more by Tehrani women. Slice the almonds and put them in a sifter. Then, grease the bottom of the tray. Afterwards, pour sugar and honey and oil into a small bowl and put it on the stove; the heat should be medium. Sometimes spin the mixture. Add the almonds and let them turn golden. When it is completely golden, melt the saffron in a little bit of water and pour it. Lower the heat so that the Honey Sohan only stays warm. With a small spoon, put a bit of the mixture in the tray and immediately place two or three pistachios on it. After cooling we remove them with a knife and keep them in a capped container.